About meI have always been a voracious reader. When I was younger I devoured books. I remember taking trips to the library and bringing home bags of picture books and chapter books. My reading proved to be such an expense that Mom would only take me to "real" bookstores to purchase new books on special occassions. I did, however, frequent the used bookstores biweekly by the time I was in middle school. My habits are still what they were as a child. I generally have multiple books going on at once; I get giddy when I first walk into a bookstore, used or new; I keep the library busy, and when I'm not reading books, I'm reading about books, or I'm teaching from books! About my libraryAt this point I am mostly using my library as an efficient place to keep my (one of my?) 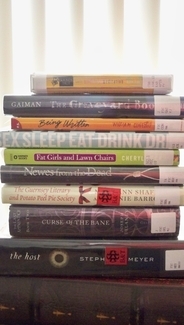 TBR lists going. Some of these books I own, most of them I don't. It is my hope that, after I read them, I write a small review and delete that little 'tbr' tag. I have just started a book blog (below) where I post all of my reviews - a lot more in depth than what you'll find here. Come visit me. I'm always looking for suggestions, comments, or discourse!